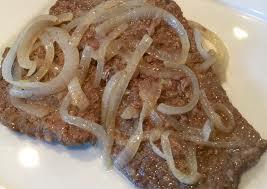 Bistec Encebollado (Steak and Onions) - Tienditadepuertorico.com - Buy Puertorican Food Here!! Pound meat to tenderize it. Combine vinegar and 3/4 cup olive oil. Add olives, oregano, cumin and garlic; set aside. In nonstick skillet, heat remaining 1/4 cup of oil and saute pepper and onion lightly. Remove pepper and onion with slotted spoon and set aside. Reheat oil remaining in skillet until very hot and sear beef on all sides. Return pepper and onion to skillet with meat. Pour oil-and-vinegar mixture over meat.